They don’t call it the “Grand Old Lady of Shuter Street” for nothing. Massey Hall is coming up on its 125th anniversary. Part of its charm, of course, is that stepping inside is like entering another century. But there are challenges that come with that, challenges that can’t be staved off. That’s why Massey Hall is seizing on a unique, once-in-a-generation opportunity to make essential upgrades, to physically expand, and to solidify the venue’s role in Canadian music—not only its history, but its future. 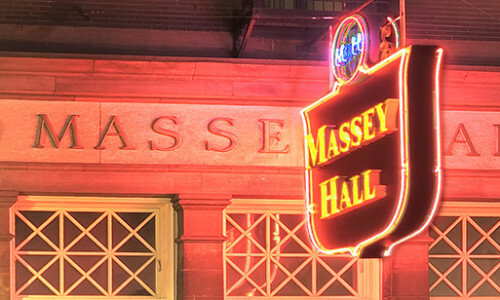 When the City of Toronto first started designating Heritage Sites in 1973, Massey Hall was one of the first on the list. No wonder. Before Neil Young’s 2014 show at Massey, the Canadian musical legend was told of the coming renovations. That night he warned the crowd, “Don’t let them change this place.” Emotions run high with a beloved institution like Massey Hall, which is why the revitalization’s mandate is to improve everything in the Hall, while being careful not to change the unique character, look and feeling one gets from being there, preserving the special, intimate relationship between artist and audience that Massey Hall is known for is paramount. If you’re drinking on the balcony, you need to descend two flights of stairs to access the basement bathrooms. Oh, and the iconic sign out front and century-old stonework could use a little TLC. Surely even the most conservative, preservationist fan of Massey Hall would recognize all the above as problematic. There are also necessary improvements that are all but invisible to the average patron. If you’ve ever walked down Shuter Street in the morning, you’ve likely seen production equipment being loaded in through the front door. That’s because unlike every major performing arts venue in North America, there is no backstage loading dock. The backstage dressing rooms are inadequate by modern standards. All mechanical, electrical and plumbing infrastructure need significant upgrades. From day one, Massey Hall was meant to be an intimate hall—no seat is more than 27 metres from the stage—with amazing acoustics. That won’t change. The redesign’s primary purpose is to retain the character of Massey Hall, to make it even better at what it already is. Massey Hall’s first major renovation occurred in 1933, when a lobby entrance was created, the badly worn wooden stairs were replaced with stone and steel, a lounge was opened in the balcony, 900 seats were removed, and an Art Deco influence led to a new look for the lobby space. In a second major renovation in 1948, concrete was poured to form a new main-floor seating and stage area, for fire safety reasons and additional structural support. The last significant change was more than 20 years ago, when the Centuries bar opened in 1994, the year of the Hall’s centenary (hence the name). The impetus for the current revitalization came in 2012, when Tricon Capital and MOD Developments acquired a plot of land on Yonge Street that included the 1905 Bank of Commerce building, with plans to build a 60-storey condo building. The deed came with a 450-sq.-m back lot, located immediately behind Massey Hall, which was not necessary for the condo project. They graciously decided to transfer that part of the lot to Massey Hall. That led to talk about finally building a loading dock—and if the shovels were going to be ready anyway, why not launch a badly needed, full-blown revitalization project in time for the 125th anniversary in 2019? And so: elevators will be installed in the new South Tower addition, making all levels accessible to those with mobility issues. The auditorium’s ceiling will be repaired. Seats will be replaced and sightlines improved. The exterior fire escapes will be removed and new patron exit routes will be built. There will be an elevated exterior ring of walkways built around the upper levels that will lead to more bars and bathrooms in the South Tower. Centuries will be expanded. The brick, stone and metalwork of the exterior will be cleaned and restored—as will the marquee sign, of course. One aspect of Massey Hall’s structure has been literally hidden from view for more than 100 years: the 73 exterior and 18 interior stained-glass windows—some of which are 16 feet tall—that run along either side of every level in the auditorium, in the attic and on the back wall of the gallery. Built in 1894, they were boarded up sometime in the first half-century, due to street noise. They have been largely unseen by the public since—until now (or, rather, soon). The final aspect of the revitalization won’t be evident while you’re watching a show in the auditorium, but it will help Massey Hall stake its claim in the future, rather than just trading on its history. Integrated into the historical site, the new South Tower will make Massey Hall a multi-use hub that houses education, film, archival and digital content creation throughout, with a focus on developing the next generation of great Canadian artists who will one day headline Massey Hall. There will be additional performance spaces, a learning environment for music and recording, exhibits and other elements that will enhance Massey Hall’s educational and communit outreach programs. The first phase of the revitalization is already complete: demolition of the obsolete Albert Building and finishing the foundation for the South Tower. The second phase will begin in 2018, with Massey Hall planning to “go dark” for up to two years during work on the historic building and the construction of the South Tower. Sadly, that means there will be no performances during the 125th anniversary year. But the end result, to be revealed in autumn 2020, will be not only an improvement on a venue that the world knows and loves, but a realization of Massey Hall’s full potential as an engine of cultural vitality. Every great music city needs a prestige anchor venue, one that is widely recognized as the premier venue in town, the room that every local artist aims to fill one day, the space that every touring artist wants on their itinerary. Ideally, it’s also a venue that is not only an anchor in the community, but a catalyst: one not dependent on its history but that uses it as a springboard, one that consistently innovates and engages the community and new generations of artists. Massey Hall is that venue, for both Toronto and Canada at large. With the changes under way, it’s about to start a whole new chapter that will ensure it’s at the forefront of the musical conversation.